or Urdu to English Dictionary plays an important role in learning a language. The aim of this dictionary is to make English easy both for experts and beginners. English Urdu dictionary helps us to define words and find their easy meaning in English or in our Urdu language. Pak English Urdu dictionary has the largest database of English Urdu words and we update this dictionary on daily basis even if you are not able to find any word typed in the search box, our database will save that word and it will be available in the next 24 hours with complete and comprehensive way. This Dictionary includes almost all the existing English vocabulary. You can also ask for the Urdu meaning of any difficult English word by contacting us via contact us page. Are you studying English and you want to know the meaning in real Urdu font. Then this program is for you. This dictionary can be used in two modes, one is English to Urdu dictionary, and another is Urdu to English dictionary. A full and complete offline English to Urdu Dictionary. You also can say its English to Urdu Dictionary. Urdu to English Dictionary, Pakistan Dictionary. The vocabulary of dictionary English to Urdu is constantly being updated. This is not only a Dictionary but also a learning tool. MCQ (Multiple Choice Question) option is available. There is auto suggestion so you need not type full words. This will be helpful to find out the meaning of any word. The leading and most trusted English to Urdu dictionary is now available for FREE! Translate English to Urdu and Urdu to English. Set Urdu keyboard from mobile settings. More than 200000 English, Urdu words for offline translation. Big collection for offline dictionary. We try to store maximum meaning collection in offline. WHAT MAKES PAK ENGLISH TO URDU DICTIONARY BETTER THAN OTHER DICTIONARIES?
. The most comprehensive coverage of English everywhere it’s spoken.
. The very latest vocabulary, with over 450,000 words, phrases and meanings. 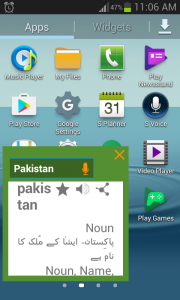 The Pak English to Urdu Dictionary is a mobile dictionary with advanced search and language tools that have become the staple of quality language apps from Mobile Systems. No internet connection is required to view the definitions or thesaurus. A Full and complete Urdu to English Dictionary. > Easy to use, fast and works offline. > Layout is very simple and is user friendly. > App using Android system overlay window to find meaning anywhere in the app. > Offline, work without Internet. > Every word you ever viewed is stored in history. > Urdu to English Dictionary & English to Urdu Dictionary. 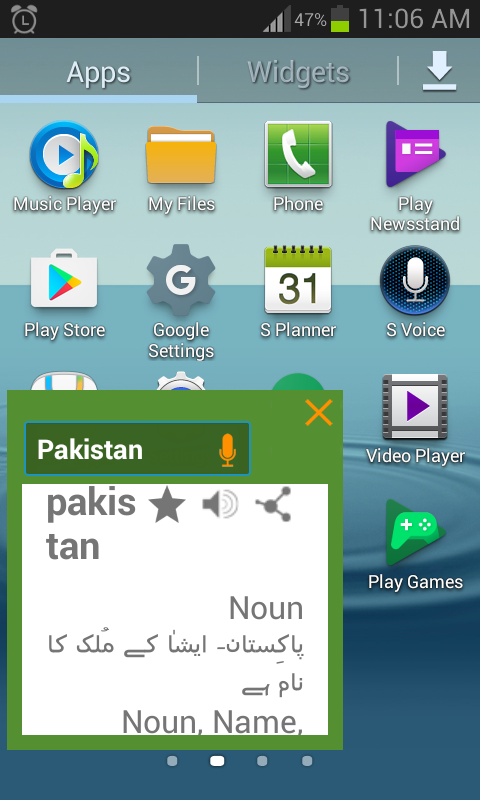 > Fast Searching (کی تلاش ) for Urdu words and English words. > Create Favorite words list. > Text to speech dictionary English to Urdu. > Word correction for mistype words.